Ensynch has just released a new SharePoint WebPart that will display a tree view of all of the sites in your SharePoint environment. Props to Joe Zamora and Jerry Camel for all of their development efforts, designing and creating this WebPart. There are two versions of the Site Navigator, the Lite Version and the Professional Version. The Lite Version, is available at no cost and will allow you to select a starting point for the tree and additionally will allow you to "trim the tree" based on user permissions. The Professional version, which is available for a small fee, adds some additional functionality to set the automatic expansion depth, show site collections only, and adds an option to select which web applications to show instead of setting a URL starting point. 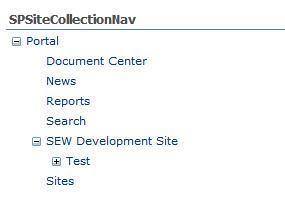 We are going to discuss building the SPSiteCollectionNav class first. Now that we have implemented all of the necessary functions, we can begin customizing our code. We are going to use the CreateChildControls() method to initiate the creation our tree and add it to the WebPart Controls Collection. We are also going to add a new property that we can set with our EditorPart to dynamically change properties of our tree display. Here is enough to get you started. Next, we will work on adding some customizable properties to our WebPart. This is done with the EditorPart. And there you have it. 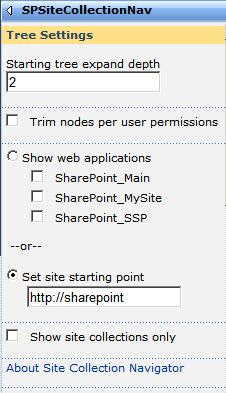 The Create Date checkbox will appear in the properties pane of the WebPart and can be used to turn on and off the display of the Site Create Date in the Site Node text of our Navigation WebPart.